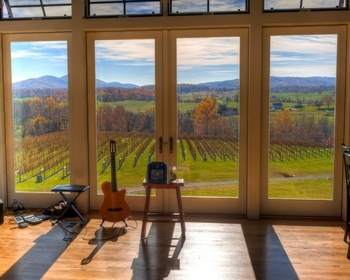 Virginia’s wineries are the stewards of our beautiful open spaces. Preserving farmland and creating a sustainable way of life for generations to come, owners and winemakers are strong supporters of the “green” lifestyle. 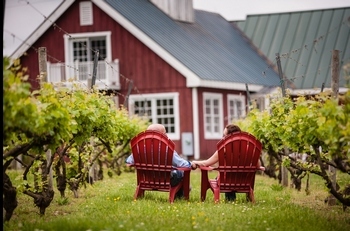 Virginia Green is a partnership among the Commonwealth’s tourism-related businesses - wineries, lodging, restaurants and attractions - devoted to promoting sound environmental practices. Member wineries embrace these principles: to recycle and reduce waste and to minimize the use of disposable food service products. They commit to minimal use of pesticides, herbicides, fungicides and fertilizers, and to use water efficiently. And naturally, these wineries have all designed their operations to reduce overall energy consumption. We support the wineries that have made the commitment to Virginia Green, and we hope you will, too. It’s big, it's fun, and it's friendly. Firepits, dozens of picnic tables, live music, and beautiful sunsets over the mountains are on offer here. And nowhere are dogs more beloved than at Barrel Oak. Read about Barrel Oak’s commitment to Green. Window tables in the tasting room and sunny decks on two sides reveal a romantic view of Lost Mountain. The tranquility won't be interrupted by loud crowds or scampering kiddies at this adults-only refuge; no large groups (more than six), buses or limos are accepted. Peaceful! Read about Delaplane’s commitment to Green. Colorful flags brought back from Siena and regulation-sized bocce ball courts out back proudly reflect Gadino’s Italian roots. Visitors return often because they feel at home here. The sound of dogs and kids playing near the vineyards make this a true family affair. Read about Gadino’s commitment to Green. Read about Little Washington’s commitment to Green. More about Little Washington Winery. A Gold LEED-Certified winery, North Gate’s goal is to net out to zero energy usage. The Tasting Room is 100% solar powered and built with locally sourced green building materials. The tasting bar is reclaimed wood with a gorgeous recycled wine and beer bottle bar top. Read about North Gate’s commitment to Green. As the “Founding Family of American Wine”, there are few places that can boast the depth of history that Philip Carter Winery reflects. The family carries a legacy as producers of the first internationally recognized fine wines in America dating to 1762. Read about Philip Carter’s commitment to Green. 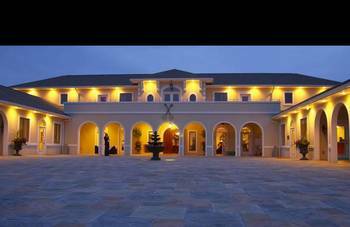 More about Philip Carter Winery. An imposing red barn - circa 1870 and rebuilt by Amish barn-raising specialists - is home to the four-sided tasting bar, lots of open space with little gifties for purchase, and an open second-story balcony, reserved for use by Sunset Hills Wine Club members. Read about Sunset Hills’ commitment to Green. At Afton Mountain Vineyards, it’s as if you've entered a sumptuous living room, with high, beamed ceilings, elaborate chandeliers, and dramatic floor-to-ceiling drapes. And all that BEFORE you take in the spectacular, mountain-top view from the hillside deck. Read about Afton Mountain’s commitment to Green. A massive Platinum LEED-certified building with inside/outside tasting bars (plus a private tasting room), art exhibits in an upstairs gallery, and a huge deck overlooking the vineyards invite you to bring your picnic baskets, pets, and kids. Read about Cooper’s commitment to Green. Looking out the big windows of the DelFosse Vineyards tasting room, you can make out a log cabin just up the hill, across the dramatically terraced vineyards. It’s a perfect spot for a romantic weekend. And you are in luck -- the 100+ year-old cabin is for rent! Read about DelFosse’s commitment to Green. Deep in Virginia wine country, you encounter this full-scale tropical conservatory, with palms, starfruit plants, and coffee bean bushes. Warm, moist air wafts over tables tucked beneath banana trees, as musicians weave magical spells over the packed house. Read about Glass House’s commitment to Green. Stinson’s tasting room is fairly small but comfortable, and doubles as a unique farm store offering grass-fed beef, farm-raised pork and chicken, free-range organic eggs, local produce, and garden fresh herbs. An outside deck and lawn offers lots of options for hanging out or picnicking. Read about Stinson’s commitment to Green. DuCard is a sustainable winery that operates on solar power. The tin-roofed buildings sit in the shadow of Old Rag Mountain, and the spacious tasting area features a marvelous floor of mixed hardwood reclaimed from local barns complemented by plenty of outdoor seating. Read about DuCard’s commitment to Green. Loving Cup Winery opened in 2013 as the first, and only, certified organic winery in Virginia, and one of only a handful on the East Coast. Wines made from five different hybrids including Marquette, Corot Noir, Traminette, Cayuga, and Vidal Blanc get snapped up quickly. Read about Loving Cup’s commitment to Green. Virginia's first fruit winery, Peaks of Otter also produces a few vinifera wines, but fruit wines are clearly still first in their hearts. They produce nearly 40 different types, including Kiss the Devil - a jalapeno wine that's typically taken with a chaser of Cheese Whiz. Read about Peaks of Otter’s commitment to Green. 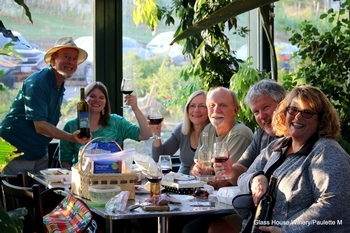 More about Peaks of Otter Winery. White Rock is the very definition of an "intimate tasting experience," with a tiny two-person tasting bar in a sunlit room with a dramatic view over the vineyards. In 2015, White Rock branched out and became a brewery as well, focused on the styles of Germany, Ireland, and Belgium beers. Read about White Rock’s commitment to Green. Williamsburg Winery is one of the largest in the state, producing more than 65,000 cases. Buy your timed ticket in the retail shop or online to see a video presentation, tour the cellar room and production area, access a small museum area, and sample several of the nearly 30 wines that Williamsburg produces. Read about Williamsburg’s commitment to Green. An international flair is evident at CrossKeys, with owners and staff coming from Iran, South Africa, and France. Arched doorways surround an open-air piazza and CrossKeys’ kitchen puts out foods prepared using produce from the winery's garden, or grown nearby. Elegant wedding venue! Read about CrossKeys’ commitment to Green. In the tasting room, the small bar serves maybe four guests at a time, and a deck off the back features vineyard and mountain views. It's an intimate, remarkably quiet place, where all you hear is the passing breeze. Read about Lexington Valley’s commitment to Green. As much farm as winery, Wisteria is a quiet spot were you are welcome to roam the paths down to the creek and lay out a picnic, or settle into an Adirondack chair tucked into a shady corner. 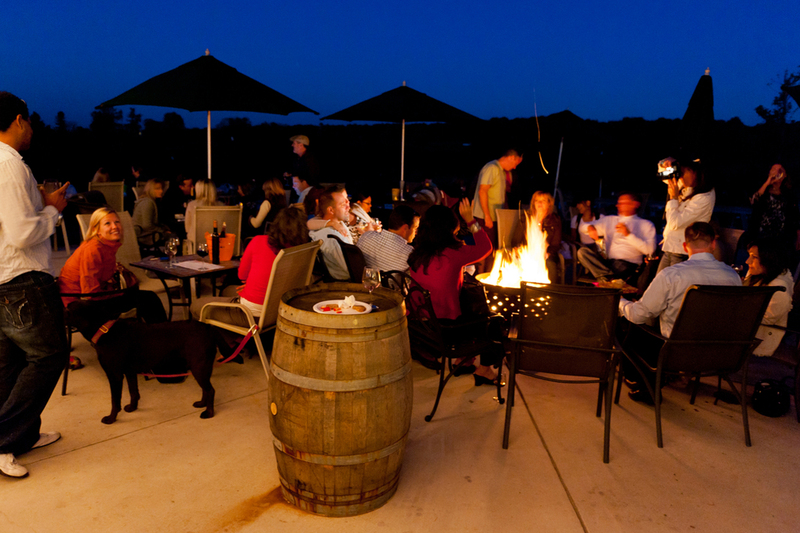 In cooler months, the fireplace in the tasting room is the place to be, or outside toasting marshmallows by the firepit. Read about Wisteria’s commitment to Green. Giles County is well known to outdoor enthusiasts for the New River, Jefferson National Forest, and Appalachian Trail. In 2015, a tiny tasting area in Tom and Diane Mullis’ garage and some outside seating with long distance views opened to a mostly-local following who enjoy chambourcin and vidal blanc wines here. Read about Giles Mountain’s commitment to Green. West Wind Winery is bigger and more sophisticated than you might expect for this out-of-the-way spot. Half a dozen old barns dot the property, which has been in the owner’s family for a century. The tasting room is both modern and rustic, and the gift shop is filled with high-end local art, soaps, candles and food. Read about West Wind’s commitment to Green. Formerly Attimo Winery, Whitebarrel was reborn in 2015. Rik Obiso clearly enjoys experimenting - his amber wine, a Georgian-style process in which white grapes are fermented and aged like reds giving the finished product an orange hue, is a current darling of the sommelier set. Read about Whitebarrel’s commitment to Green.